When it comes time for shooting around the city, point A to point Z and everything in between, no one will argue that it's tough to beat a MINI for versatility, go-kart like handling and straight-up thrill when getting around town. Now, fans have good reason to believe that all those smart looks and the ability to slide itself into the smallest of city spaces have an eye to get even more MINI. 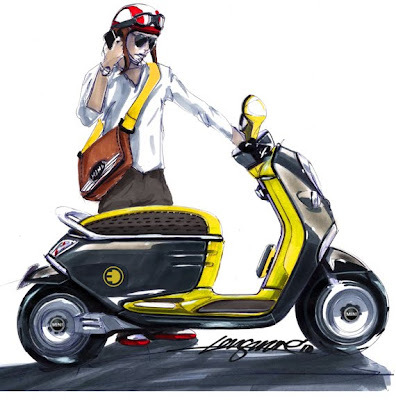 For the fashionable looking to find the future of urban mobility - say hello to the MINI Scooter E Concept. while minis are well known for their small compact scale, their latest vehicle takes it to a new level because the new mini is actually a scooter. the mini scooter e, as it is called, was unveiled yesterday. the electric scooter was designed by bmw director of design adrian van hooydonk and will make its debut at the end of the month. the scooter charges through a plug-in system and features a docking station for smartphones which also serves as the key to start the engine. special software on the device then acts as a GPS system for the scooter and also notifies users when other mini scooter riders are nearby. 3 models of the scooter e will be released with the other two to be seen at the upcoming paris auto show.